Congratulations on your recent interview! Now it’s time to send a thank you letter to each person who was in your interview. This will demonstrate your gratitude as well as keep your name in the minds of hiring managers as decisions are being made. According to Alison Doyle of About.com, “When asked about the most appropriate way for candidates to follow up, 38% of managers surveyed said that hand-written notes were acceptable, while 87% said email worked. 81% said a phone call was appropriate, as long as the interviewee didn't call multiple times. 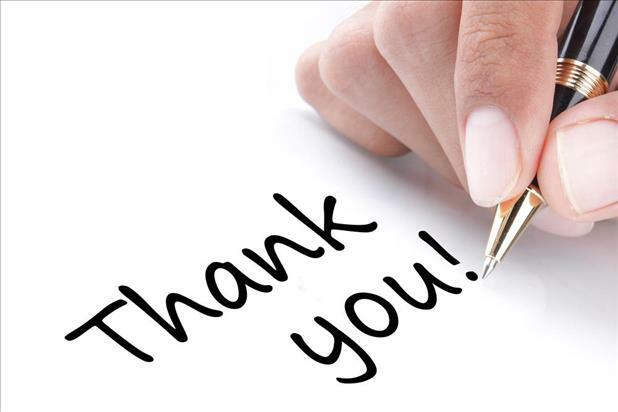 Social media is another way to say thank you with 27% of managers considering it acceptable.” With this in mind, emailed thank you notes will be appropriate for the majority of your interviews, but use your best judgment. Courtesy & Interest: Today’s employers are pressed for time, so you want to thank them for speaking with you. If you are still interested in the position, clearly state that you are! Express why you are excited about the opportunity so the employer knows what stands out to you about the company and the position. Connection: Tailor your letter to the company, and make sure to connect with the employer. You can do this by mentioning the goals of the company or the position and what you can do to help achieve those goals. Clarification: Didn’t interview well or failed to mention something important? Use this opportunity to redeem yourself. Reiterate your experience and what you bring to the table to make a difference in the position. Summarization: Briefly mention what you talked about in the interview to reinforce your top selling points. First Paragraph: Use the first paragraph to thank the interviewer(s) for taking the time to meet with you. Mention your interest in the job and how enthusiastic you are about the open position. Second Paragraph: Include the reasons why you are an excellent fit for the job with a list of specific, relevant skills. The more detailed you are, the more the interviewer will know how your qualifications match the position, but make sure to write concisely. Third Paragraph: The third paragraph (optional) can be used to mention anything you'd like the employer to know that you didn't bring up in your interview. This gives you another chance to make a good impression, especially if you remembered something you should have said.